Ria Singhal has an Honours and a Masters degree in literature from University of Delhi. Soon after her education, her entrepreneurship spirit got her to Fuzia- which she joined in 2015 and has continuously helped in its global expansion and growth. Ria is a firm supporter of Fuzia’s mission of empowering women through the power of creative expressions by way of fusion of culture & ideas. 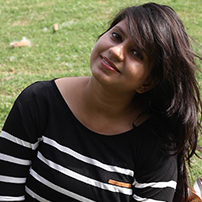 She heads everything from the Digital Marketing, content, contests/campaigns and engagement and finds newer ways of association and expansion each time. She is a believer of learning by experience and owes a lot to this entrepreneurship journey with Fuzia- where she learnt, improved, met people from over the world and had amazing experiences. In her personal life and free time, she loves to travel, eat and explore. Her bucket list includes driving around the world with a few pet dogs some day!